Welcome to the website of the Pocono Dulcimer Club (PDC). We are a group of diverse individuals spanning age and culture who gather monthly to develop and promote the playing of the Appalacian Mountain Dulcimer and the Hammered Dulcimer. The Appalachian mountain dulcimer and the hammered dulcimer are traditional instruments in American culture that have roots in our cultural heritage and in cultures from around the world. The Hammered Dulcimer is an ancestor of the piano. It is a trapezoidal instrument with many courses of strings which the player strikes with small hammers. It may have originated in the Middle East during the first millennium AD, and versions are found throughout Europe and Asia. The hammered dulcimer became popular in England during the reign of King James I (1566-1625), and British colonists brought it to America prior to the Revolution. In contrast, the Appalacian mountain dulcimer is a relatively new instrument and is uniquely American. It was born in the Appalachian mountains in the early 1800's and appears to be related to German, Scandinavian and French folk instruments. A German folk instrument called the scheitholt is very similar to the mountain dulcimer and early examples of both instruments have been found in the mountain communities of southwest Pennsylvania (Mercer Museum, Doylestown, PA) and other Appalachian mountain states. Mountain dulcimers are also known as “lap” or “fretted” Dulcimers because they are played resting in the player’s lap, and the three or four strings have frets like a modern guitar. The music played on mountain and hammered dulcimers is based in traditional American culture: the aurally transmitted fiddle tunes, folk songs and sacred songs (gospel tunes, shape note hymns and spirituals) that were integral to work, play and worship before the days of radio and gramophone. 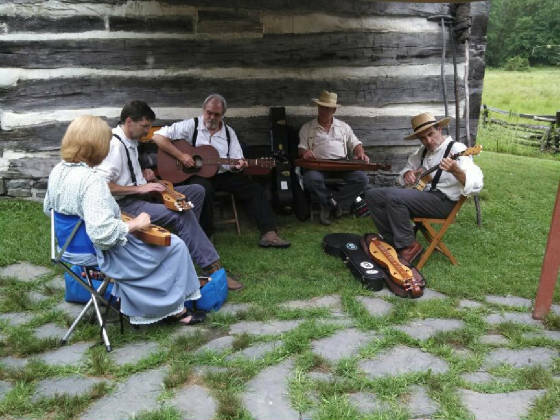 Thus, the PDC is engaged not only in encouraging the spread and preservation of two traditional American instruments, but also the traditional music that graced the lives of our ancestors.